The donation honors the strategic partnership that the two organizations started more than two years ago, primarily around the need for foster families and how Devereux Florida could partner with the Florida Hospital church and its foster parent ministry. The relationship has developed into a joint effort to support hundreds of children and families in central Florida. The Florida Hospital System operates a broad network of hospital and physical health clinics throughout Central Florida, and is part of the national network of Seventh Day Adventist Healthcare. 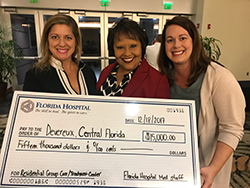 “For Devereux Florida to have the opportunity to partner with one of the nation’s leading healthcare systems and one that shares a mission of healing for those in need is an honor,” said Lindsey Phillips, Devereux Florida director of External Affairs, who was on hand to receive the check. The gift was one of the largest donations Devereux Florida received in 2017, but it represents more than financial support. “The gift was especially meaningful as our two organizations have such a parallel commitment to physical and emotional well-being of children and families,” continued Phillips. This is not the first demonstration of support from Florida Hospital. Cash gifts to Devereux Florida have taken place as part of the hospital’s employee-giving program, and late last year, the hospital’s community impact team “adopted” Devereux Florida’s Threshold and Orlando campuses for an in-kind donation of landscaping and installation. 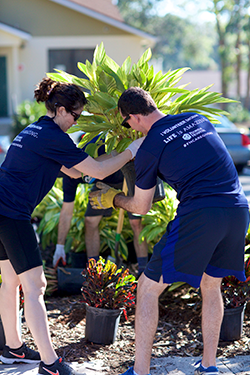 The event was part of the hospital’s “Day of Caring,” and its landscape design team lent its expertise to further beautify the Devereux Florida campuses. “We are so grateful for the gift from the Medical Executive Committee and for the overwhelming support we have received from the entire Florida Hospital community,” said Phillips. The donation will directly support Devereux-assisted children and families. “Together we can make a real difference and strength the resources available for overall well-being in our community,” she added. To learn more about Devereux Florida’s programs and services, click here. To learn more about Devereux Advanced Behavioral Health, click here. From left: Lindsey Phillips, Devereux Florida director of External Affairs; Yamile Luna, Florida Hospital Community Impact and Volunteerism assistant vice president; and Meredith DeLaCruz, Devereux Florida business relations manager. Volunteers from the Florida Hospital System help beautify the Devereux Florida campuses as part of their annual "Day of Caring."